It is nearly upon us, this Summer’s biggest sporting event, the European Championships. 24 teams across 6 groups will vie to become European Champions. France plays host for the third time, in what will be the 15th renewal of this great tournament. For the first time in the event’s history we will see 24 teams compete, which is 8 more participants than we have seen in the last 20 years. In these previews we will be looking at each sides’ qualifying campaign, their respective top scorers in qualifying and who may well be their star performer at this summer’s tournament. Without further ado, let’s start in the most obvious place of all. France are the host country and therefore qualifying was not necessary. Whilst everyone else spent the last year qualifying, France littered their fixtures list with International Friendlies, including home and away ties against teams from Qualifying Group I. This was a new initiative from UEFA to better prepare host nations. They would have won the group with 7 wins, 2 draws, 1 loss, bettering Portugal by 2 points. Dmitri Payet – This could be a bold pick given that he is part of a squad that includes Blaise Matuidi and Paul Pogba in midfield plus attacking players such as Antoine Griezmann and Anthony Martial, but I believe the West Ham man could really take this tournament by storm if given the chance by coach, Didier Deschamps. He is very capable in set-piece situations and should he score one of his incredible free-kicks in a vital situation he could be well get the nod as top performer. It would be easy to pick Paul Pogba or even Antoine Grizemann, however the pair have only managed a combined 12 goals in 55 games for their country and although Payet only has 2 in 16, he showed big signs of improvement this year and that has come at a great time. The hosts will be looking to win, no question. France enter every major tournament as one of the favourites, due to their constant conveyor belt of talented footballers (despite the weakness of the top domestic league) and this year is no different. If they play to their full potential, there is no reason they can’t win it all. They have a world-class goalkeeper in Hugo Lloris, a capable defence and a plethora of midfield and attacking options. A mixture of wily veterans and young superstars provides a good balance and this team can definitely win their third European Championship. Ciprian Tătăruşanu – Romania qualified for the their first major tournament finals in eight years and did so undefeated. This was in no small part down to the team’s ability to keep a clean sheet. In 10 games, the side conceded just 2 goals and the man leading that defence is Fiorentina’s goalkeeper, Tătăruşanu. If Romania are to enjoy in any way a sucessfull Euro 2016 campaign, they will need to continue to keep it tight at the back and for that to happen, Tătăruşanu will need to be at the top of his game. If he can do that, he will earn plenty of plaudits along the way and possibly another big summer switch. Expectations will be low, whilst the Romanian’s kept it tight at the back during qualifying (they had the best defensive record), they were not exactly free-scoring. They scored just 11 goals to finish in 2nd place behind Northern Ireland who in contrast scored 18. There are places up for grabs in the last-16 for the 4 best 3rd-placed teams and this to me looks like the only chance of Romania progressing. Elseid Hysaj – The right-back plies his trade in Serie A for 2015-16 runners-up, Napoli and he will be relishing the chance to represent his country on the biggest stage in his country’s history. Reports suggest the attacking full-back is attracting interest from top clubs such as La Liga side Atletico Madrid and Premier League side Chelsea, who after the tournament will be led by former Juventus and current Italy coach Antonio Conte. He tracks back well and can put in a decent cross too (although his side is not blessed with strikers who can get on the end of it) so he will be an important player in both attack and defence. If he is going to get that summer move I am sure he is dreaming of, good performances against France and Switzerland will thrust him further into the spotlight. Despite qualifying for their first ever major tournament, expectations must be tempered. This is an inexperienced side at this level and with only a handful of players playing in top leagues, it is hard to see them achieving much in a tough group. In addition to their inexperience, 3 of the 14 points they garnered in qualifying came courtesy of Serbia abandoning the home game against them, resulting in a 3-0 Albania win. This was due to the Serbian fans storming the field and attacking the Albanian players after a drone carried a pro-Albanian flag over the stadium. 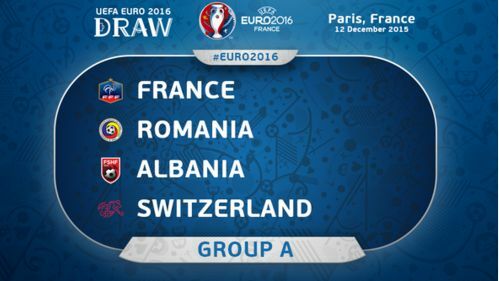 Most importantly though, football-wise this Albania side will struggle to cope against France and Switzerland but if they can somehow pick up a result against Romania and even finish above them in the group they may well consider that an achievement, as they could progress to the last-16 thanks to the new rules. Xherdan Shaqiri – Whilst many eyes will be on Arsenal’s latest signing, Granit Xhaka, I still think the Stoke City attacker is the focal point of this team. Shaqiri scored 4 goals in qualifying, 1 more than strikers Josip Drmic and Haris Seferovic and in his last major tournament for his country he starred once again. At the 2014 World Cup, Shaqiri was named man of the match in the Swiss’ group games against both Ecuador and Honduras, scoring a hat-trick against the latter in their third and final group match, sealing qualification to the next round. They lost that game to Argentina in extra time, when Angel Di Maria broke fans’ hearts in the 118th minute, but it was a valiant effort by Shaqiri and co.
Of the current squad, Shaqiri leads the way in terms of goals with 17 in 52 games, 7 more than striker Eren Derdiyok who has only managed a modest 10 in 51 games. Whilst Xhaka may be the heartbeat of the team these days, it is Shaqiri’s attacking flair that could carry Switzerland through to the latter stages, with the absence of a star striker. Switzerland will expect to progress from Group A and will look to battle out with France for top spot. They are also very much capable of beating most teams in this year’s competition on their day and depending on their draw in the last-16, I don’t see why they cannot go far in this competition. The quarter-finals looks a realistic target and I can imagine they have their eyes on that stage and beyond. A steady side with two starlets in Xhaka and Shaqiri, there is definitely reason for optimism this summer in the Swiss camp and at the very least they should progress from the group stage for the first time in tournament history. That concludes part 1 of this 6-part series, be sure to keep an eye out for parts 2-6 in the coming days!